Duo: Two-person meeting space. Incorporating bench seating and an integrated table. Duo incorporates a table top power solution and vertical cable management. Team Meeting: Team meeting space for up to ten people. Team Resource: A centralized location for shared resources along with storage for consumables such as paper, cartridges and waste solutions including recycling stations. Haven Pods are constructed using a tubular steel frame, the design of which incorporates the specific fixings required for linking and attaching accessories and built in furniture elements. The core of the screen is created using a composite of materials to provide a stable structure with enhanced acoustic properties and is fully upholstered in Camira Blazer fabric. The panels are linked using a specifically developed quick release linking system situated at the top and bottom of the panel. 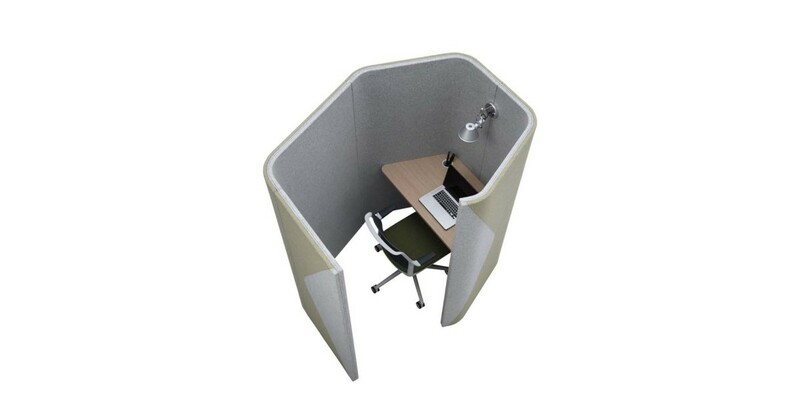 Haven Pods are designed to provide both visual and acoustic privacy within working environments. The height of Haven Pods is designed for visual privacy when seated or standing. The acoustic properties of Haven Pods have been independently verified and tested by AIRO Ltd (Acoustical Investigation and Research Organization). In a test environment they provide a 50% reduction in ambient noise creating a very effective acoustic shadow for their occupants. 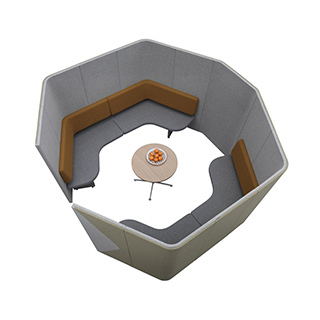 The Haven Team Meeting Pod is a way for teams to meet comfortably in an open office. The open office has delivered many benefits; however there is a need for privacy within the workplace environment. Haven Pods provide a defined space for individual focused work and spaces for team collaboration. The space efficient geometric design also enhances the acoustic performance of the product. Haven Pods nestle and tessellate to maximize available space, allowing the creation of a community of environments and destinations. 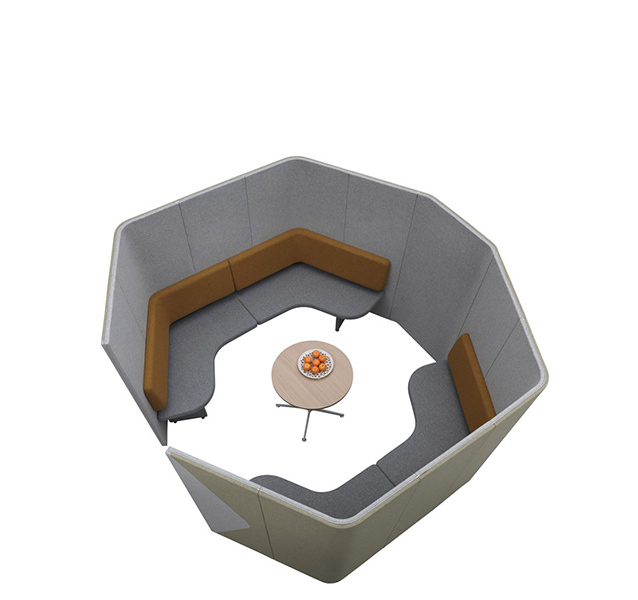 Haven Pods are ideal for either an individual within a desk based environment looking for a space to focus or for teams to gather for impromptu meetings. 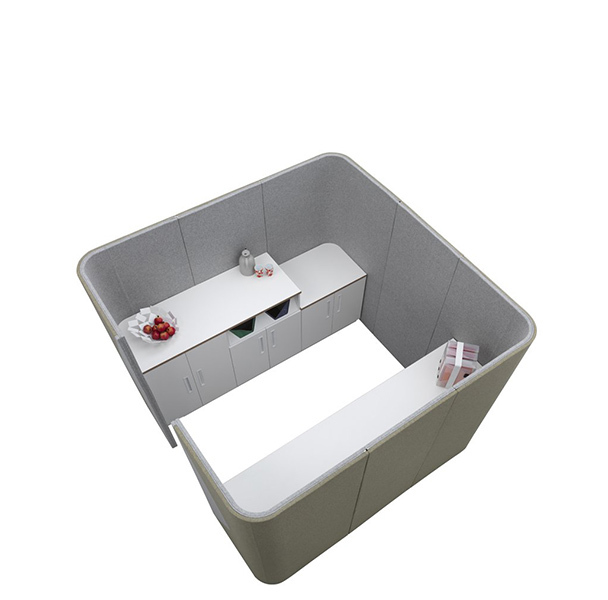 The Haven range consists of a number of pod sizes – from individual desk options to meeting spaces accommodating up to ten people.